Country lanes can be made of asphalt, wood, and pour concrete. But it is better to use paving slabs. It is easy to understand and you can create ornaments that will decorate the landscape of the area. Sand, crushed stone or gravel, tile, trowel, stakes (metal or wooden), a rubber mallet, twine, wooden mallet, rake, broom, garden hose with a diffuser, manual rammer, cement M400 or M500 (you can substitute dry plaster), geotextile. If you want borders, then it will take another curb. 1. Measuring tape make marks on the ground. Hammer the pegs on the edges of garden paths and using rope install the border. 2. 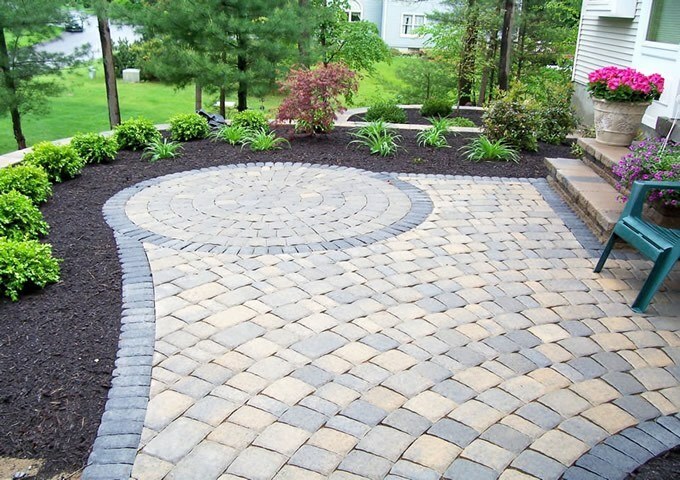 Measure the width and length of the area that you will pave a tile. Multiply these values and you will be able to know how many square meters you need to buy paving slabs, that is, the area of the fenced area. Also stock up on sand and gravel (crushed stone). 3. Make a base for laying paving slabs. This will deepen the surface future tracks 20 cm, carefully remove all the roots of the plants, being careful not to hit seeds. 4. If the soil is dense, such as clay, and not to pass water, do drainage. To do this, lay on the bottom of the excavation gravel or gravel layer of 15 cm, tamp, pour it on the sand layer of 5 cm and moisten with a hose with a sprayer. But tamp the sand after only 3 hours when it is fully saturated with moisture. 5. To drain the water between the gravel and sand to place the geotextile. He will hold the sand and will not allow him to score the cracks in the gravel. In addition, the geotextile allows to make a reliable design that can last and withstand even the load from the vehicle. The gravel layer can be replaced with coarse sand, if you build track on soils where moisture is not stagnant, and easily goes into the ground. 7. You can now lay the tile itself. Do it myself to avoid stepping on the prepared surface. Leave gaps between individual tiles in a 1-2 mm. Utrambovyvaya wooden mallet. When the track is ready, align the bumps with a rubber mallet. 8. Fill the seams with cement-sand mixture or dry plaster mixture, sweep the surface with a broom. And then moisten with a hose with a sprayer. If the hydration hose dipped layer of the mixture in the crevices, add more. Gaps should not be. An important point that the sand to fill the cracks must be very clean and fine. After 2-3 days on the track, paved with paving slabs, you can walk. If you need to make a rounded shape, make the base as described above. Then lay all the whole tiles, and extreme try and draw on it the boundary line, and then cut off the excess with a grinder.